World Water Day, coming up this Thursday, is an annual worldwide event designed to focus attention on the importance of water to all living things. Promoted by the United Nations, the 25-year-old World Water Day has always raised concerns about the 2.1 billion people in the world who don’t have easy access to clean water, creating a major health crisis in some communities. This year’s theme is “nature for water” — although the discussion remains focused mainly on humans. Human actions have contributed to increasing flooding, drought and water pollution — and humans are able to use natural systems to help reduce the problems. So-called “nature-based solutions” include protecting and improving water quality by restoring forests and wetlands, reconnecting rivers to their floodplains and creating vegetated buffers along lakes and streams, even in urban areas. 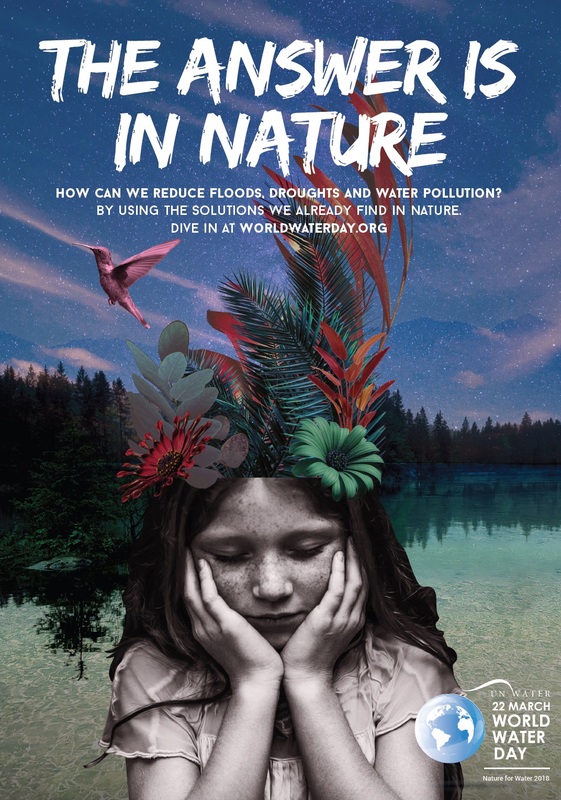 A fact sheet (PDF 2 mb) put out by UNESCO (U.N. Educational, Scientific and Cultural Organization) lays out the arguments on behalf of nature-based solutions. A larger 150-page report, titled “Nature Based Solutions for Water” (PDF 42.7 mb) can be downloaded from the UNESCO website. A series of posters and cards related to this year’s theme can be downloaded from the World Water Day website. For the creative, I’m intrigued by the idea that you can create your own collage, using individual elements taken from the four posters. See “collage kit” on the same resources page. Considering that this is the 25th World Water Day, I anticipated more events and celebrations. The one event listed for Washington state is a guided tour of Edmonds Marsh, one of the few urban saltwater estuaries still remaining in the Puget Sound region. Details of the walk are provided in a brief article in Edmonds News. The first video on this page is a promotional piece by UNESCO. I found the second video, filmed in Istanbul, Turkey, to be revealing about people’s attitudes about water. I imagine the reaction might be the same in some U.S. cities — although the specific location probably makes a lot of difference. The video, produced in 2015, was created for Standart Pompa, a manufacturer of water pumps. The video shows a video screen next to a water faucet with a dying tree depicted on the screen. When passersby turned off the water faucet, the tree suddenly transformed into a healthy green condition. Although the weather was cold during the filming, nearly a third of the people going by took their hands out of their pockets and turned off the water, which was actually recirculating from the drain so that no water was wasted. The third video is a cartoon designed to drive home a message about the importance of water, beginning with the simple act of brushing your teeth. It was produced by TVNXT KIDZ.